Students examining the “Politics of Food” track comestibles from the farm through the regulatory process to the table to see how and why decisions are made. 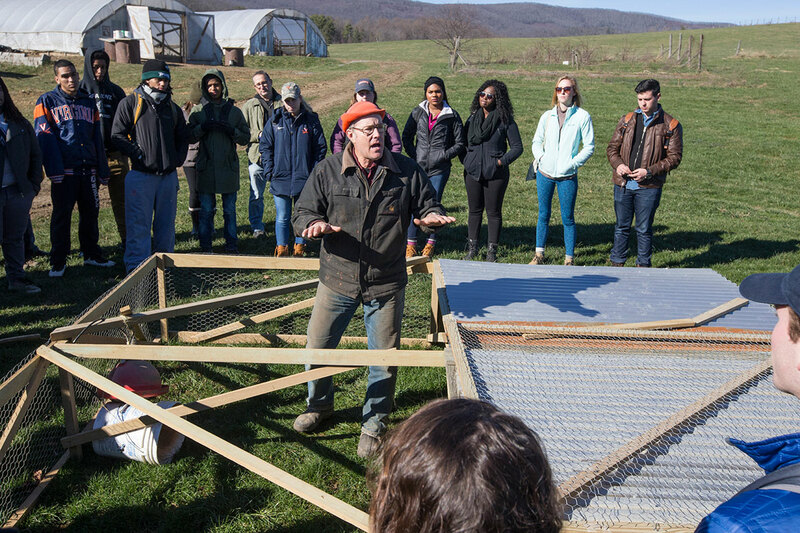 The University of Virginia students in Professor Paul Freedman’s January term course stood rapt in a circle on a farm in the Shenandoah Valley as Joel Salatin – a man one described as “a rock star” in the modern farm movement – explained how he shelters about 800 chickens in a plastic-covered hoop house for the winter, then uses the thoroughly fertilized space to raise vegetables once the weather turns warmer. Salatin, proprietor of Polyface Farm in Swope, practices a holistic agriculture, raising beef, hogs and fowl organically, building the soil, interlacing the various elements of the farm to work together. 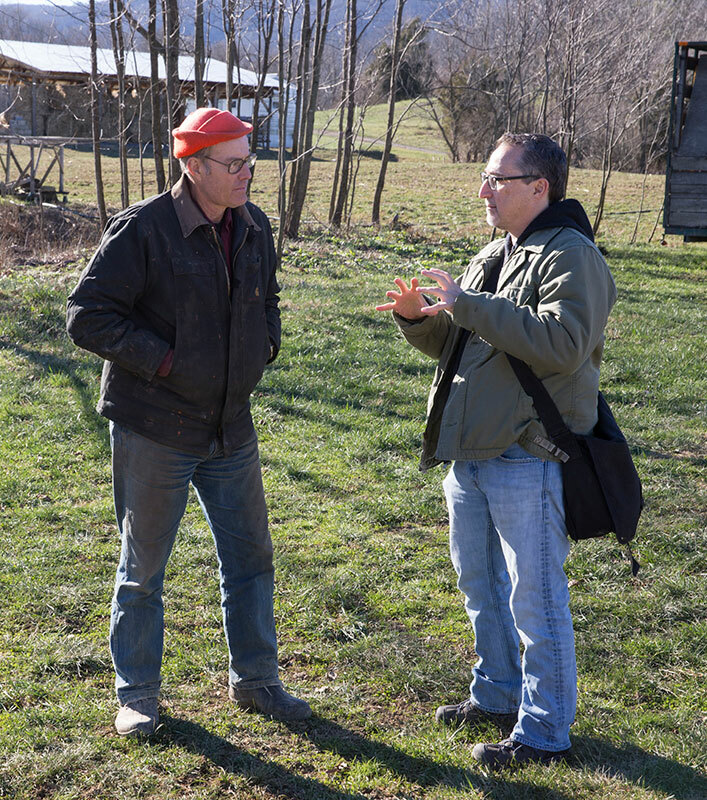 In explaining how his farm works, Salatin was giving the students, through contrast, an acute understanding of how more conventional farms work. 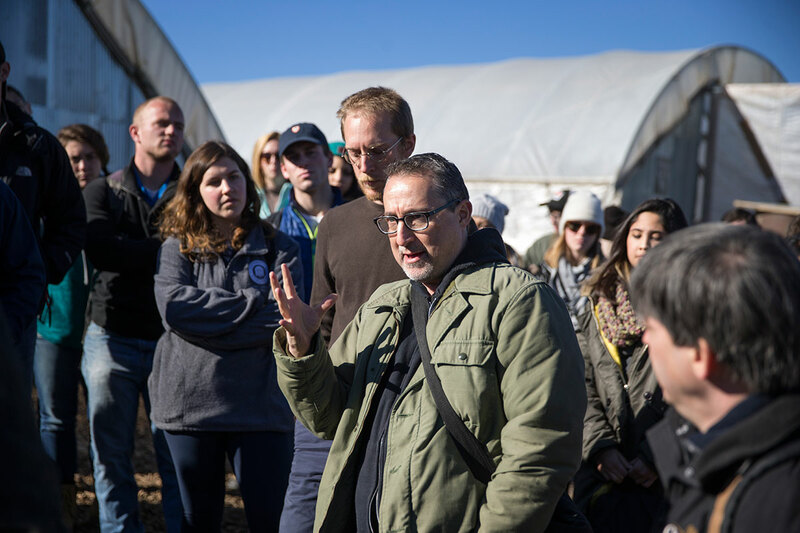 The field trip to Polyface Farm was one element of Freedman’s course on the “Politics of Food,” which examines policy and politics surrounding agriculture, food processing, distribution and retailing, so the students can understand their food’s origins. “I want to introduce students to food as a political topic, so they can make sense of their own food choices from a political, ecological, economic and social stand point,” said Freedman, an associate professor in the Woodrow Wilson Department of Politics. He wants the students to see how political considerations impinge upon many food-related policy decisions, many of which are not immediately obvious. Food politics and policy in the U.S. are topics that have received increased attention in recent years. Legislation, regulation and subsidies for particular products and practices have critical implications for the environment, for health (including the dramatic rise in obesity, diabetes and drug-resistant infections), and for other budget priorities. Required reading for the course includes Michael Pollan’s “The Omnivore’s Dilemma: A Natural History of Four Meals” and Robert Paarlberg’s “Food Politics: What Everyone Needs to Know.” Freedman adds numerous shorter readings and also includes short films on various topics. Last week, Salatin gave an enthusiastic talk about food production to the students as they stood between sheds of composting manure and other organic materials, and cows and pigs that were producing more material for composting. Freedman’s students have also heard from experts such as Stuart Pape, a two-time UVA graduate who has worked on food safety regulations for the Food and Drug Administration and been a lobbyist and attorney for companies who have to comply with those regulations; and Anna Maria Siega-Riz, a public health specialist who has served as a member of the Dietary Guidelines Advisory Committee. “The process by which science gets translated into regulations is a political process,” Freedman said. The course has been eye-opening for students. 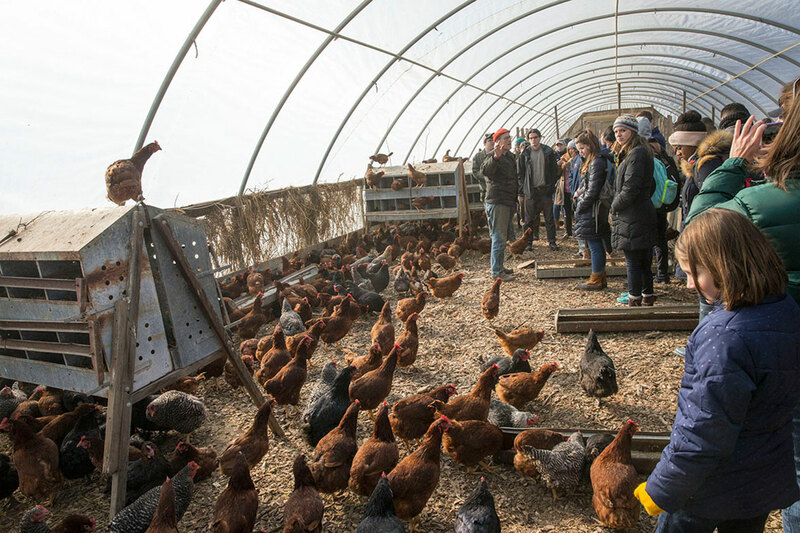 “I didn’t know you could raise chickens like this,” said Aidan Thayer of Arlington, a third-year aerospace engineering major, nodding toward one of Salatin’s five hoop houses holding chickens. With Freedman’s course, he has come to understand how many of his food decisions are already made for him, he said. “I’m probably still going to go to McDonald’s, but I also know I am going to make some changes and try to eat cleaner and more locally,” he said. Johnathan Chance, an adult student in the Bachelor of Interdisciplinary Study program in the School of Continuing and Professional Studies, was already aware of food. He works as a private chef and also as a winemaker’s assistant at the Thibaut Janisson Winery in Afton. Rachael Shepard of Shipman, a fourth-year math education major, had a personal interest in the class, since her grandfather had raised beef cattle; she wanted a small view into the world he inhabited. What she has seen far exceeded her expectations, she said. She said she had learned a great deal about monocultures, or dependence on a single crop, and the conditions under which animals are raised in large farms. Freedman said the UVA students, with their tradition of student governance, have much influence on Grounds, including the food served in the dining halls and in other food venues. He cited the students in the Nitrogen Working Group, part of UVA’s Environmental Stewardship Subcommittee under the University Committee on Sustainability, who came up with a pilot project to give a sustainability rating label to foods sold in the Clark Café – not based on the ingredients, but on the carbon, nitrogen and water involved in the food’s production. Freedman started teaching the January term course in 2010, at a time when he said the politics of food were not self-evidently important to people. He raised questions of food policy and its effects on farmers and consumers. The compression of the course works well, Freedman said, adding that during a course in a full semester, he will have a particular group of students 150 minutes a week. He said the politics of food touches just about everything in the food system, “from seed to sewer.” The course explores how people across the country are making an effort to take back control over their food. “Whether by raising backyard chickens, starting a schoolyard or neighborhood garden, or buying from local farmers, people are working to reclaim their food,” he said.